Grayson escorted her to a door on the right, threw it open, and put his hand on her waist, guiding her inside. A gas lamp burned on a nearby table, throwing stark, deep shadows into the room. Her determined man shut the door and pinned her against it. He plucked her glasses from her face and threw them onto the table with the gas lamp. Then he pinned her against the door, placing his hands on the door next to her arms. His breathing was erratic. The light from the lamp cast dark shadows over his chiseled features. He stepped closer and lowered his hands, placing one on her waist. Heat spiked within her and settled low in her abdomen. His hazel eyes burned with desire. He drew in a deep breath and raised his forefinger, tracing her lips. Alice closed her eyes, but only briefly, savoring the gentle touch of his finger. "You do wild things to my heart, sweet Alice," he finally whispered. His finger traced her cheeks, then her jaw. She grew hot, yearning for more. Her senses spun from his sensual touch. She could hardly breathe. "Me?" "What do I do to your heart?" "You make it beat hard -- fast." He ran his finger down the side of her neck and traced the 'v' in her throat. Alice met the raging inferno in his eyes and nipped at her lower lip with her teeth. "Is that all I do?" He issued a low, deep groan from his throat and leaned forward. 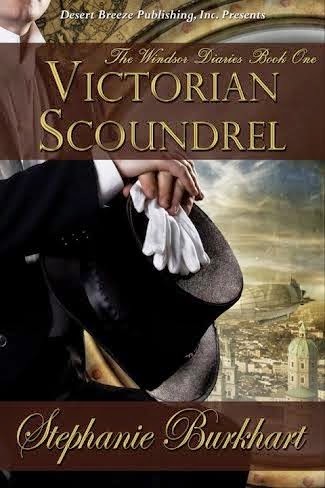 Victorian Scoundrel by Stephanie Burkhart is a 2011 Desert Breeze publication. I was provided a copy of this book in exchange for an honest review. This is book one in the Windsor Diaries Series. It is 2011 and Alice and Edmund Windsor are time tripping all the way back to 1851. It's a slippery slope and Alice is well aware of the dangers they could possibly create by causing a ripple effect if they do anything at all to disrupt history. No sooner do they “land” at Buckingham Palace, Alice's necklace ends up being taken from her which has her stranded in the past. She has her hands full trying to keep Edmund from doing something stupid and trying to get that necklace back. She also finds herself really attracted to Grayson Kentfield. Despite the obvious trouble a relationship with someone from the past would cause, Alice can't seem to help herself. Meanwhile Edmund is having his own flirtation with Kiera Russell. Alice is beside herself with worry when Edmund strikes up a friendship with their great grandfather, Prince Albert. Edmund is determined to show off things to Albert he really shouldn't be sharing. It's only a matter of time before some folks start putting two and two together. Grayson being one of them. So, the dilemma Alice wanted to avoid becomes unavoidable and a hard choice must be made. The past or the future, or a leave behind the man she has fallen in love with. But what if he turned out be a Victorian Scoundrel? Stephanie Burkhart is fast becoming one my favorites. Anytime I have a chance to read one of her novels I do not hesitate. The Windsor Diaries is a unique series falling into the Steampunk Science fiction genre as well as the historical romance genre. All the characters are whimsical and fun and had me thinking about a flying time machine and where I would go if I could and how fun it might be to rub elbows with my ancestors. However, I do think we would all find the temptation to give them a sneak peak into the future would be irresistible and we would not know what effect that might have. Also, we could find ourselves in Alice's predicament by falling in love with someone not of our own time period. What a heart wrenching choice that could turn into. However, in this instance the tampering with history will cause some problems for Edmond, Alice, Grayson and Kiera and their time traveling days are not yet behind them. What a great review, thank you. I can't wait to read it. What a nice time-travel historical romance story, I'd like to read it. Thanks! Thank you so much for having me here today. I'm so glad you enjoyed the story. Time traveling can be a lot of fun, for sure! Does anyone want to share their favorite time traveling story or person? You can draw from books, movies, and TV. I'd love to hear who your favorites are. 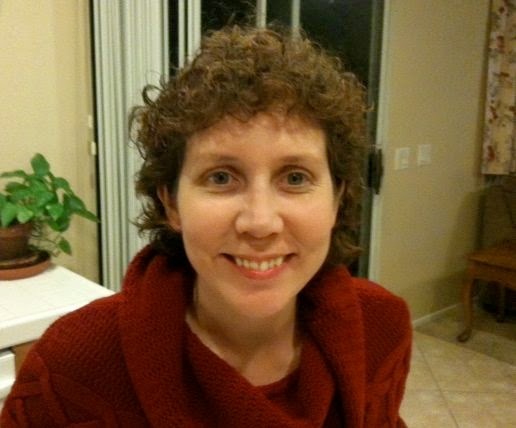 Looks like a good one, Steph! congratulations on a wonderful review! Great review. I bought a copy of your book a few days ago but haven't read it yet. It is being moved to the top of my 'read-me-next' list!